Our mini pocket folders are small in size but large enough to leave a lasting impression. 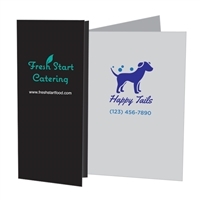 They’re a great option for when a full-size folder is too large for your promotional material needs. All of our small presentation folders are available in these sizes: 4’’ x 9’’, 6’’ x 8.75’’, or 5’’ x 9.5’’. The 4’’x 9’’ pocket folds conveniently fit inside a #10 envelope for easy mail delivery. Our 6’’ x 9’’ mini folders with pockets are slightly bigger but just as easy to carry and store. Portable and affordable, all of these small presentation folders come with two pockets, allowing you to stuff them full of necessary information. Choose to add a slot for a business card or USB flash drive on one of the inside pockets. Enjoy affordable volume pricing, a free sample, free setup and free shipping on all of our custom mini folders.